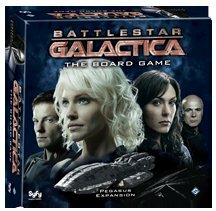 The first expansion for Battlestar Galactica: The Board Game. The Pegasus expansion adds two new supplemental game boards featuring the Battlestar Pegasus and the planet of New Caprica, seven new characters, a new Cylon Locations overlay, two plastic Basestars, as well as new Destination, Crisis, Loyalty, Quorum, Super Crisis, and Skill cards. The new Pegasus board can be used by itself or together with the New Caprica board to create the game you desire â€“ use the Pegasus alone for the additional firepower she provides, or add the New Caprica board to simulate the rebellion on the human colony, bringing the game to an epic level. New rules introduce the ability to play as a new character type â€“ the Cylon Leader, with a new Treachery Skill card type. How will the crews of the Galactica and the Pegasus mesh when they join each other on your game table? Will the Cylons be able to subjugate the human rebellion on New Caprica? Will an open Cylon Leader be able to vent the last remaining humans into space, giving the toasters control over the galaxy? Other products in the "Battlestar Galactica" series. This was the first expansion for Battlestar Galactica the Board Game, and it is a very good one. Components are of the same high quality as the base game, but what really makes it interesting are the changes to gameplay that are introduced. My favourite are the Cylon leaders, who can now have individual secret goals that give them new motivations and provides a much more unpredictable behaviour from the Cylons. A great addition for fans of the base game. This is the first expansion you should buy if you've already worn out the base game a bit. This adds a new ending/win condition by trying to escape the settlement on New Caprica. I usually did not play with the new ending, but kept the base "jump to Kobol" rules for ending the game. Also, this expansion adds new characters, new cards, and new (awesome looking) basestars to make your game even more enjoyable. The most interesting thing that this expansion adds into the mix is the ability to choose Cylon leaders as your character at the beginning of the game selection. These Cylon leaders have hidden agendas to accomplish so you can never be sure if they are working for your cause, or against you. This is an extremely interesting dynamic in practice. If you enjoy the base game even a little bit, this is an expansion that you should pick up whenever you can. This expansion offers a bevy of options to one of the best board games of all time. Now, there are new characters, a new type of deck, Cylon leaders with hidden agendas (some helpful to the humans!) and a whole new endgame on New Caprica. Pick and choose which elements to add for the best customizable experience. Recommended.